First Line: Titian, Rubens, and Van Dyke, it is said, always practiced their art in full dress. In the London of the 1850s, a series of murders has almost brought the city to its knees. 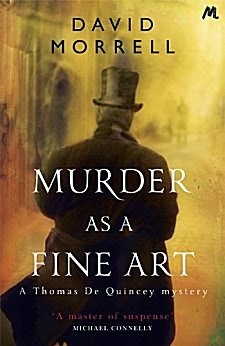 Not only are these killings horrific, they mirror crimes that were committed decades earlier... and they also seem to have the same blueprint: Thomas De Quincey's essay "On Murder Considered as One of the Fine Arts." Two Scotland Yard detectives are working against the clock in order to capture the killer, and whether they like it or not, they find themselves working with De Quincey and his daughter Emily. Crippled as he is by his addiction to opium, this frail man in his sixties still has a brilliant mind that can look into the thoughts of a brutal murderer and know he must be stopped at all costs. While I was in college, I read Thomas De Quincey's Confessions of an English Opium Eater. When I recently learned that David Morrell had written a mystery with him as a sleuth, I thought back to De Quincey's Confessions and knew what a marvelous character he could be. To my delight, Morrell has done him justice. And then some. During this investigation, Scotland Yard detectives Ryan and Becker do the hard work while De Quincey is the ideas man. De Quincey was saying things about dreams and the subconscious (he even coined the word) many decades before Freud, so it is a definite battle of wills between this frail, brilliant, and odd little man and the detectives who are used to a more physical style of investigation. Ryan and Becker also have to get used to the bloomer-wearing Emily De Quincey who has been raised to think and speak for herself. As much as she shocks the two young men, she isn't the hindrance they're convinced she'd be. Quite the opposite in fact, and one of the pleasures of reading this book was watching the two men begin to admire her. Is there a budding romance in Emily's future? And with which of the detectives will it be? This is only one of the many reasons why I look forward to reading the next book in this series. Morrell brought Victorian London to life, and the action sequences were excellent. (Any time I read an action sequence and become worried or frightened, I know it's good.) We are treated to excerpts from Emily's diary throughout, and although these entries bring a needed break from tension, I have to admit that Emily's eye for detail had me wondering if she had a photographic memory. Occasionally Morrell would change to a third person omniscient point of view to share facts about Victorian England that were important to the plot. As interesting as these passages were, I found that they took me out of the story, although I haven't got a clue how the author could've imparted this information in a less intrusive way. With a hair-raising story, excellent action sequences, perfect period detail, and a marvelous cast of characters, I can't wait to get my hands on the next Thomas De Quincey book, Inspector of the Dead. This one sounds right up my street, Cathy. The Victorian setting, the link to literature and De Quincey, etc.. I'm not much of a one for serial killers or particularly brutal murders. Still, this book does sound absorbing. Fortunately the book is more about the sleuths than the slayer, Margot. This one sounds good too and I love reading about the Victorian era. Putting it on my list. I can see you really enjoying this, Kay!